How to easily roast a whole chicken with lemon and garlic. The meat stays juicy, and the chicken becomes ultra-flavorful. Jump to the Whole Roasted Chicken Recipe or watch our quick video showing you how we make it. The moment I smell chicken roasting away in the oven, it makes me feel all warm and fuzzy inside. It makes me think of home and my Mom. Here’s how we make it in our kitchen. Serve this silky smooth gravy next to the chicken. 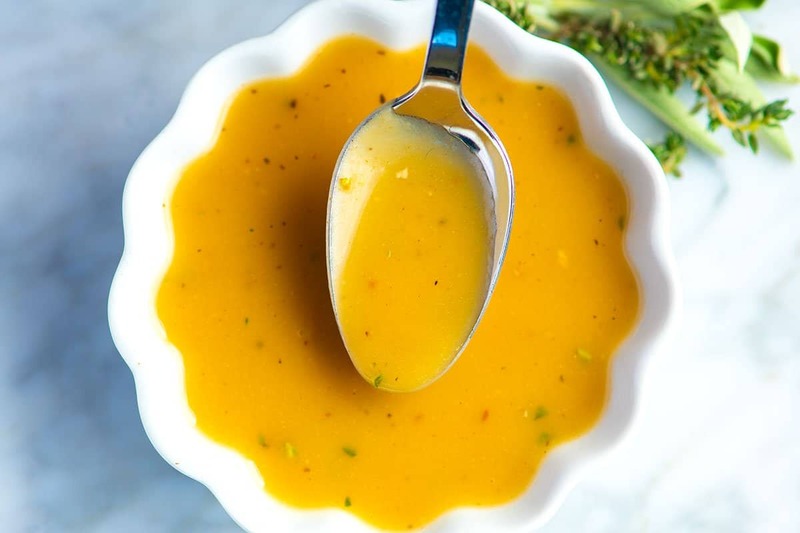 The gravy takes less than 10 minutes and works wonders with the pan drippings in this recipe! See the Quick and Easy Gravy Recipe. Our Favorite Oven Roasted Vegetables — See how to roast vegetables in the oven, so they are tender on the inside and caramelized on the outside. Easy, no-fuss and adaptable recipe based on what you have in your kitchen. Coconut Oil Roasted Sweet Potatoes with Pecans — Sweet potatoes are a staple in our kitchen and can be found roasted or baked and on our plates many days of the week. Coconut oil works so well with the caramelized sweet potatoes. Pure maple syrup adds a little sweetness, and a little cinnamon adds spice. Our Favorite Potato Salad Recipe — Such an easy potato salad recipe. We love this stuff! We would be happy to hover over a bowl of it any day. It has few extras thrown in, too. Making whole roasted chicken at home is simple and something you should know how to do. We’re sharing a basic method for how to do it. Find our best tips for making it below. Depending on where you buy your chicken, the weight will vary. For our recipe, we call for a 5 to 6-pound chicken, which is quite large. That said, the recipe will still work for smaller chickens (3 1/2 pounds). The bake time will be slightly less. That’s why we love having our instant-read thermometer handy. This way, we can accurately check the doneness of the chicken — you want it to read 165 degrees F when inserted into the thickest part of the thigh. If you do not have a thermometer, don’t worry, another good test is to slice between the leg and thigh. If the juices run clear, you should be good. How to perfectly pan roast chicken breasts with butter and thyme. 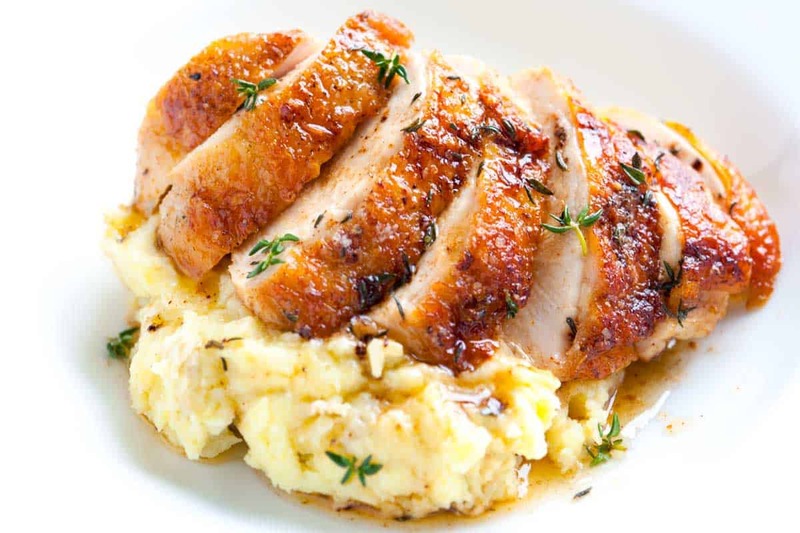 Jump to the Easy Pan Roasted Chicken Breasts with Thyme Recipe. You can roast a chicken at almost any temperature. It all depends on what you are looking for. For extremely tender, fall off the bone meat and soft skin, roast between 300 and 350 degrees for 1 1/2 to 2 hours, depending on the weight. For firmer meat and crisp skin, roast the chicken around 425 degrees F for 45 minutes to 1 1/2 hours, depending on the weight. In our recipe below, we roast a 5 to 6-pound chicken at 425 degrees for about 1 1/2 hours. 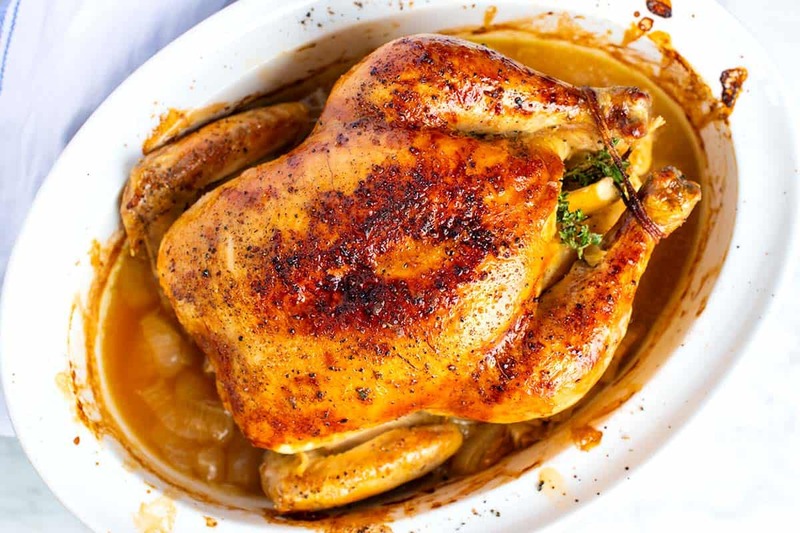 You will need a pan to roast the chicken in — a roasting pan with a rack, large baking dish, rimmed baking sheet or an oven-safe pan will all work. When it comes to seasoning, we like to keep things simple. We season the whole chicken plus the cavity with salt and fresh ground pepper. By the way, if you have the time, refrigerate the seasoned chicken, uncovered, for an hour, or overnight. This is basically dry brining which will help the skin become extra crisp and the meat extra juicy. 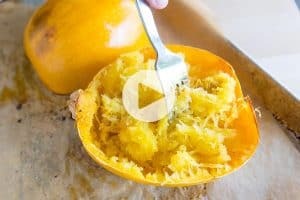 Then we stuff the cavity with a whole garlic head cut in half as well as a lemon cut into quarters. You can stick with our method or try adding a spice rub or fresh herbs to the cavity as well. Finally, you can roast the chicken on top of vegetables — in our photos, we roasted ours on top of onions. 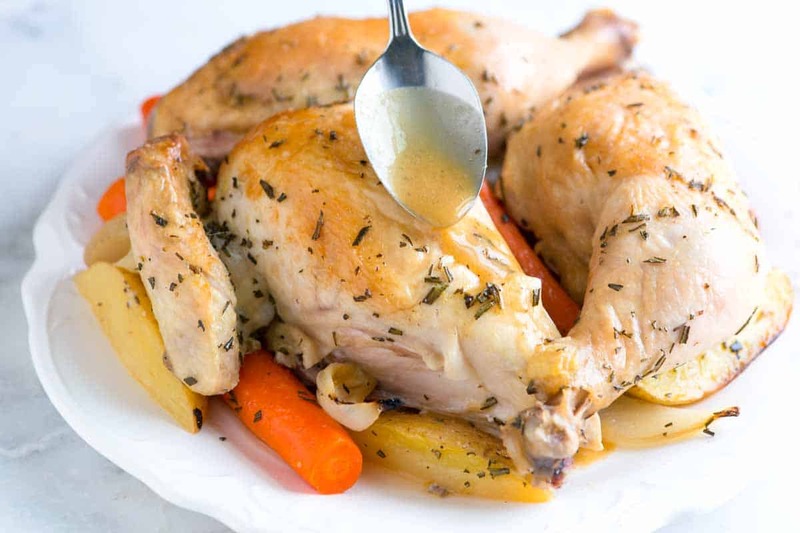 This quick and easy rosemary roasted butterflied whole chicken recipe with roasted root vegetables and a roasted lemon vinaigrette. Jump to the Butterflied Chicken Recipe. You can roast a chicken at almost any temperature. It all depends on what you are looking for. For extremely tender, fall off the bone meat and soft skin, roast between 300 and 350 degrees. For firmer meat and crisp skin, roast the chicken around 425 degrees F. In our recipe below, we roast a 5 to 6 pound chicken at 425 degrees for about 1 1/2 hours. If you have the time, refrigerate the seasoned chicken, uncovered, for an hour, or overnight. This is basically dry brining which will help the skin become extra crisp and the meat extra juicy. Generously season the chicken inside and out with salt and pepper. If you have time, refrigerate the chicken, uncovered, for an hour, or overnight. Roast the chicken for 1 hour, then spoon pan juices over the chicken several times. Continue roasting until an internal thermometer inserted into the thickest part of the thigh reads 165 degrees F or when the chicken juices run clear when when you cut between a leg and a thigh, 20 to 30 minutes longer. Let rest 10 minutes before carving. Depending on where you buy your chicken, the weight will vary. For our recipe, we call for a 5 to 6 pound chicken, which is quite large. That said, the recipe will still work for smaller chickens (3 1/2 pounds). The bake time will just be slightly less. Excited to try this roasted chicken recipe! Question: should you cover chicken at least initially? Hi Janet, We don’t cover our chicken since we love getting the skin nice and browned. 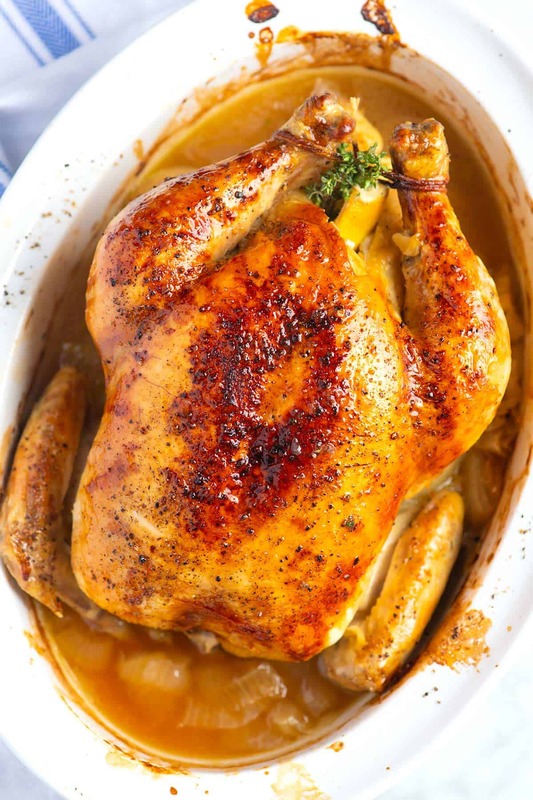 This recipe was simple and delicious simple whole roasted chicken recipe with lemon I’ve tried a lot of and with this one I feel like I finally hit gold! Full chicken taste beautiful colour perfect This was really good. Thanks. I’m in the group who “made this 2 times before reviewing” and have enjoyed a flavorful and moist chicken both times. While I am used to making a gravy with roast chicken, this one is so moist, it doesn’t need it! The first time I made it, time did not allow for the dry brining, but it was still good. I have used a bunch of thyme, parsley, and sage as the herbs. What amazes me is how the leftover meat remains moist and great for sandwiches, etc. I’m wondering what exactly makes this chicken so juicy? Is the lemon a factor? Your comments mention a range of oven temperatures. 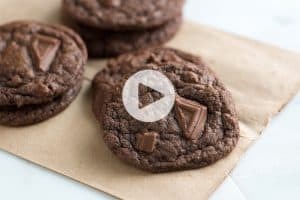 I’ve only used a 425 oven as stated in the recipe, but would I get the same moist meat from a lower temperature bake like 325-350? In other words, is the higher temperature critical to seal in juices? I forgot to mention that I did NOT baste the chicken and still got great results. Thanks for another keeper recipe! Hi Maret, I do love the lemon in this recipe and personally feel it helps with keeping the chicken moist. The higher temperature does’t really seal in the juices, but it does help with getting the skin browned and crispy (my favorite). If you were to use a lower oven temperature, the chicken will still be moist, but the meat will be much softer. The key to the best roasted chicken is to not overcook. 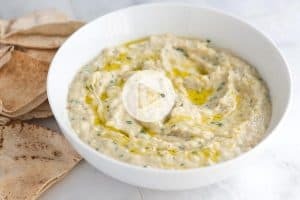 I’m so happy you have tried our recipe and thanks for leaving your comments. Hello, I am a big fan of you, and made several recipes with success. Would it be a big bother to give the temperature also in Celsius? And maybe put the cups in grams? I live in Holland and I am sure you have more fans in Europe. Cheers and keep up the good work.. This came out super golden and juicy! This will be the second time I stuffed a lemon and celery in the cavity of a chicken. I also stuffed a large clove of garlic in there with some pearl onions. I didn’t have carrots on hand (DARN), but I did have some organic Russet potatoes that I seasoned with salt & pepper, olive oil and thyme, which I mixed with some more pearl onions. I liked your idea of roasting the bird over some veggies. That takes care of a side if you’re short on time/lazy, lol. I seasoned the outside of the chicken with olive oil, cracked black pepper/sea salt lemon mix from a grinder and sprinkled organic garlic powder on the outside as well. I also had some brine left over from the Thanksgiving turkey (not homemade), which I used to brine the chicken in overnight, or about 12 hours. I will remember this one. Thanks for sharing! Made this chicken for the second time tonight, and again it was delicious. Probably the best roasted chicken I have made. I’ve tried about 5 or 6 of your recipes and all have been great! Really enjoying your website! Lauren – We have seen that episode too and have tried it a couple Thanksgiving’s ago, it is a fantastic recipe. The brine works really well, especially for turkey. I think the key is a high oven temperature to seal in all those juices. Thanks for commenting! 425 should still be fine.If you are worried, reduce to 400, it shouldn’t change too much.